Tourist Board System in Croatia, which has been more or less unchanged and in function form here for 22 years, due to the changes in the market of tourism trends, demand and utilization of EU funds is in need of restructuring in the direction of the destination management organization-DMO, which should be completed by the beginning of 2015. 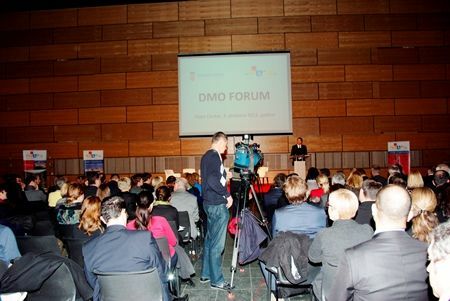 First DMO forum, which was organized by the Ministry of Tourism and the Croatian National Tourist Board (HTZ) in Zagreb’s Hypo Expo Centre and brought together more than 300 participants, mostly from tourist boards was concluded with the above decision. At the same time this is also the first time that in one place together was such a large number of representatives of the system in which there are currently about 650 employees in a total of 302 tourist boards (including the main office of HTZ and 21 county communities) of which one hundred have no direct income or less than 200 thousand kunas. In the last year the system was financed with about 561 million kunas, of which 65 per cent came from the tourist fee, and 35 percent from the tourist tax, whereby the total amount of 22 per cent went to the Head office of HTZ, 10 percent to regional bureaus, and the majority, about 50 percent to the local tourist bureaus. That’s not logical distribution of money, said a consultant from the firm Horwath HTL Branko Bogunović adding that it does not correspond to the amount of direct income which in their area realizes their community. Bogunović said some discrepancies and problems in the system that have been demonstrated by the research of the private sector, the Tourist Board and local government conducted this year as part of the HTZ’s project “Capacity building of the Tourist Board to act according to the DMO model”, among which are large politicization and bureaucracy and weak involvement of the private sector who pay the membership fee. Therefore, in the restructuring greater attention is given to regional organizations that incurred by clustering in 2008 10 tourist regions, while the DMOs on the continent would become the county tourist boards, and those at sea on the Riviera, wider areas of cities, and other larger islands with the main aim of coordinating projects, investment promotion, development and other offers. Everyone gathered from the systems that are said to be heard on the sidelines of the forum on the one hand because of the fear of business, on the other they are aware of the need for a change, tourism minister and president of CTB Darko Lorencin said as well as the Director of the General CTB Office Meri Matešić they said to everyone following the announced of restructuring do not have to be afraid to work, but it is inevitable that they will not be able to have as much Directors as today because, according to the proposal some of the smaller communities would be regrouped to tourist information centers. The key to the reorganization and subsequent operation of the Tourist Board the Minister signaled a stronger cooperation between the public and private sectors and the synergy of all stakeholders in the destination, the acceleration, the production of new tourism products in destinations, decentralization and rationalization. In this sense, will be lead a broad public debate on the reorganization and draft amendments to the law on tourist bureaus, which should be passed in the first quarter of the next year, and in operation in the beginning of 2015, said Lorencin adding that he will be working in the field much more because he wants to hear what people think and want. The forum hosted experts from the Austrian tourism organizations sharing experiences of Austria in destination management and branding of destinations and products. The forum ended with a panel on which were the chairman of the Parliamentary Committee for Tourism Goran Beus Richembergh, Rovinj Mayor Giovanni Sponza, director of TZ Dubrovnik-Neretva county Vladimir Bakić, director of a small hotel Leni from Vinkovci Željko Božić and Goran Vlasić from the Faculty of Economics in Zagreb who agreed that the HTZ system needs restructuring. All interested parties can download the operating manual for the use of destination management organizations.